In 2018, the Registry aims to become an independent not-for-profit organisation, with the support of key partners British Society of Gastroenterology (BSG), Crohn’s and Colitis UK and the Royal College of Physicians. Further progress will be reported soon. Building on considerable success to date, this new structure will allow the IBD Registry greater flexibility, enable it to take advantage of future national and international opportunities for collaboration, and to further develop its capabilities to support IBD care. The Registry’s primary focus remains on delivering useful local data that helps IBD teams to provide better care to their patients, and the partners see this stakeholder alliance as the ideal structure to ensure a sustainable future aligned with clinical and patient goals. The new structure will also allow other stakeholders to join at a later date. The IBD Registry team have realised a long-held ambition to use routinely collected hospital episode statistics (HES) data to supplement the clinical data collected by sites, in a ground-breaking initiative led by Keith Bodger and his team at the University of Liverpool’s Biostatistics Unit (Lead Analyst, Dr Mustafa Shawihdi). The result is a powerful analysis of IBD patient hospital contacts in England between 2011 and 2016, presented both nationally and by trust. The first reports focus on ulcerative colitis (UC) with a plan to release Crohn’s disease reports in a few months’ time. Novel algorithms have been developed to interrogate the data in ways that recognise the diversity of coding patterns associated with unplanned care. In addition to analysing admissions with a primary diagnosis of ulcerative colitis or Crohn’s disease, the team has captured the substantial additional burden of unplanned admissions for IBD patients where primary diagnoses relate to symptoms, signs, complications or associated conditions. They have tracked IBD patient journeys over time to analyse key end-points such as surgery and mortality. This sophisticated analysis of HES data gives teams greater insight into their IBD-specific workload and access to selected measures of process and outcome, benchmarked against the national picture. These IBD Registry HES reports have been created by clinicians for clinicians, and the team is keen to have further feedback on how to make the reports more useful to IBD teams. Please email [email protected] with any feedback. The first IBD Registry quarterly reports were published in October. The summary reports covered all the data a site submitted to the Registry, including demographic, medication and disease details. This gave gastro teams their first look at their IBD patient population. The biologics reports were made available to all teams subscribed to the IBD biologics audit in 2017/18. This report allows sites to review their performance on the KPIs against the national average and the expected standards. Non-subscribers received an example report. The next quarterly reports are due in January and will be based on information uploaded in September 2017. As ever, the team are keen to hear your ideas and feedback on the reports, so please complete this questionnaire. 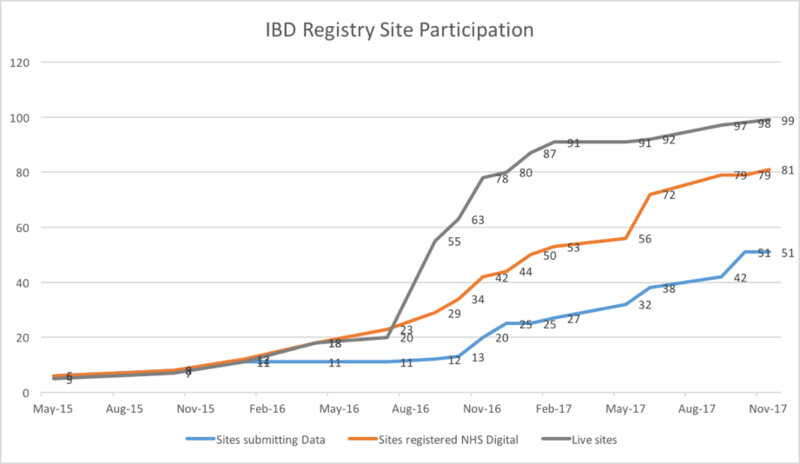 The Registry has achieved many milestones this year: 51 sites are actively submitting data, nearly 100 sites are live, 81 of these have completed registration with NHS Digital so will be able to upload data at the end of January. We now hold over 30,000 patient records which will help to inform and improve patient care and outcomes. To avoid the holiday period, and to give extra time to those teams uploading data to NHS Digital for the first time, we have moved the data submission deadline to Friday 26th January. If you need any help with this please contact Mark Allan before 21st December or after 16th January. If you would like to receive the data submission materials during the holiday period, please contact Simone at [email protected]. The Registry launched its Field Support Programme last month, with field based personnel from Dr Falk Pharma, Janssen, Pharmacosmos, Takeda and Tillotts. The purpose of this initiative is to understand and resolve local barriers, and in the first weeks we have successfully made contact with several hospitals and gained useful insights into the issues they are facing. If you feel your hospital would benefit from a meeting with one of our field based personnel, please email [email protected]. The Field Support Programme is just one example of industry support, and is featured in an article about the Registry’s Industry Working Group in last month’s edition of Pharma Times. The InfoFlex User Group had its second meeting on Monday 27th November, and reviewed a list of suggested changes to the InfoFlex system. The list was produced using feedback gathered from the survey in September, so many thanks to all of you who contributed your feedback. We are working to prioritise the list which will inform changes to the system.